Supercoat Adult With Real Chicken Provides Complete And Balanced Nutrition, With No Artificial Colours Or Flavors, To Help Keep Your Dog Happy And Healthy. Muscle Health :- Protein Rich For Muscle Health. 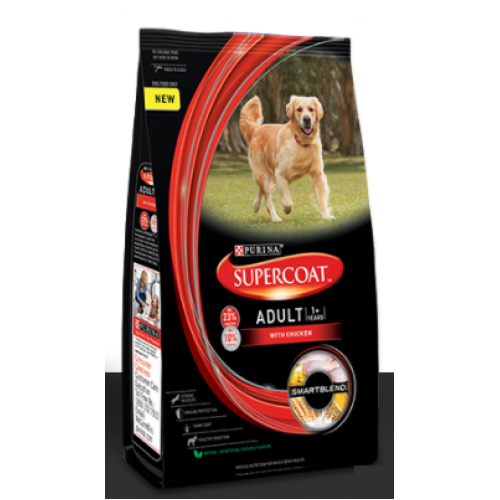 Shiny coat :- Contains Omega 3 & 6 fatty Acids For Healthy Skin And Shiny Coat. Others Details Healthy Digestion :- Keeps The Digestive System Healthy With Natural Fiber. Immune Protection :- Essential Vitamins, Minerals & Antioxidants For Immune Protection. Natural:- No Artificial Colours Or Flavors.